"This is one of my favorite dishes I make at least once a week. I ate a similar version at a friend's house who recreated it after eating it at a Syrian family's house and then made my own version at home. I usually roast the eggplant the day before or in the morning and then I can make the dish quickly when it's time to eat. I usually serve it with bread. It keeps well in the fridge as well for a yummy lunch the next day." Place eggplant on a baking sheet and poke numerous times with the tip of a sharp knife. Bake in the preheated oven until eggplant is soft, mushy, and dark brown, about 45 minutes. Allow to cool, about 1 hour. Peel eggplant and cut flesh into large cubes. Place into a bowl. Mix tahini, lemon juice, and grated garlic in a cup. Add 1 tablespoon pomegranate molasses and salt; mix well. 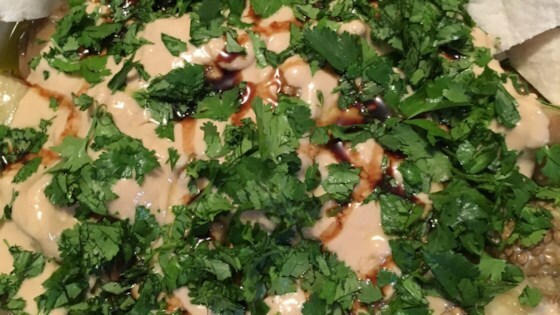 Pour tahini sauce over eggplant and mix well. Drizzle with remaining 1 tablespoon pomegranate molasses and olive oil. Sprinkle parsley on top. You need to adjust the amount of pomegranate molasses to your own personal taste. I usually use a large clove of garlic and hence a little more pomegranate molasses, but it's up to you.